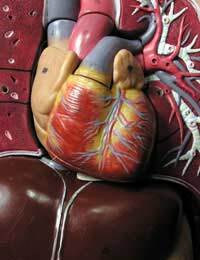 The heart muscle is made up of two upper chambers, the atria, and two lower chambers, the ventricles. Between the left atrium and left ventricle lies a valve called the mitral valve and between the right chambers is the tricuspid valves. Along with these valves are two further ones called the aortic valve and the pulmonary valve. All of the valves of the heart exist to encourage the flow of blood in the correct direction preventing back flow, which can be dangerous. There are two main diseases that can affect the valves of the heart. The first is called stenosis, which happens when the valve becomes narrowed preventing the efficient flow of blood through then heart and causes some degree of resistance. The second type is known as incompetence and occurs when the valve does not close properly and allows the blood to flow backwards into the chamber from which it has just left causing the heart to have to pump it back out again. Symptoms of heart valve disease vary from person to person and depend on what type of disease the person is suffering from. Typical symptoms include, but are not limited to, breathlessness, chest pain, tiredness, palpitations and fluid retention such as swollen ankles. Symptoms can tend to worsen on exertion and in advanced stages, only small amounts of physical activity can lead the heart into being exerted. If the disease is in its early stages of development or has not progressed, the individual may experience no symptoms. There are many causes of heart valve disease, some preventable, others not. Coronary artery disease, whereby the arteries that supply the heart muscle with blood become blocked, is a leading cause of these conditions as the valve can become damaged as a result. Rheumatic fever, although not seen in Britain any longer, is still a problem in other countries and the valves become damaged as a consequence. A condition known as cardiomyopathy can cause the valves to become thickened and blocked, and also those with a congenital heart condition may also suffer from heart valve disease from birth. For some, simply treating the symptoms is the only option, and drugs such as diuretics (water tablets) can be given to help reduce the fluid accumulation that may occur on the lungs and limbs. Other medications include those that aim to relax the blood vessels and encourage the blood to flow more smoothly through the vessels, and those that encourage the heart to pump the blood a little harder aiming to push the blood more forcefully through the valves. For some, surgery may be an option, and typical surgical procedures for this condition include balloon valve surgery, during which a balloon is introduced top the affected valve and inflated, hoping to widen the narrowing caused by stenosis, or the repair or replacement of the valve during which the damage is either repaired of the entire valve replaced using a medical device. Unfortunately those who suffer from heart valve disease due to a congenital heart defect will be unable to prevent the condition from occurring, but may be able to prevent the condition from worsening or help with the severity of symptoms by following medical advice strictly.For others, leading a healthy lifestyle that is low in fatty food, tobacco, alcohol and with a regular exercise programme, the chances of developing the condition as a result of coronary artery disease is significantly lowered. Heart valve disease can be either an effect of another cardiac disease or can be present from birth. Symptoms vary from patient to patient and treatment options are dependable on the cause of the disease and on the individual’s needs and state of health.